A faculty member's research on how stars affect the density of their orbiting planets will provide his students the opportunity to gain key analytical skills while carrying out research - plus, present their findings at a national scientific conference. Brendan Miller, assistant professor of physical science, won a $32,000 grant from NASA's Chandra X-ray Center, which operates a telescope orbiting in space. The observatory detects X-ray emission from very hot regions of the universe such as exploded stars, clusters of galaxies, and matter around black holes. The grant will enable Miller and two students to utilize data collected by the telescope. They'll attempt to determine how much of a planet's gaseous density can be burned away by its nearby host star's UV and X-ray radiation. This will be accomplished by studying two stars that each have a closely orbiting planet (even closer than Mercury is to the Sun in our own solar system). The project will help scientists understand how planets evolved to their current state. "For instance, if we find a Super-Earth close to its star, is it possible that it began its life as a gas giant and was transformed by an active star into the denser, rockier remnant that we see today?" Miller said. "The bigger picture implications are that if stellar activity is effective in shaping planets, then we also have to look at the impact farther out from the star, including potentially at the habitable zone." 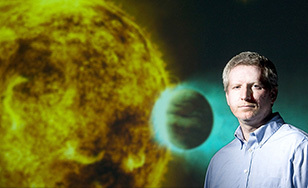 The project also includes observations with NASA's orbiting Swift telescope obtained through the University of Michigan, and the research is being performed in collaboration with scientists at the University of Michigan, Pennsylvania State University, and the Harvard-Smithsonian Center for Astrophysics. The project will last up to two years. Miller said that the investigation adds to St. Scholastica's large and diverse set of existing research opportunities for science majors. "It's a chance for students to work on a project that provides a lot of skills that are very transferable to what they're intending to do in the future," Miller said. "It's really helpful to see that as an undergraduate. It's something that made a big difference for me."